Cheers! 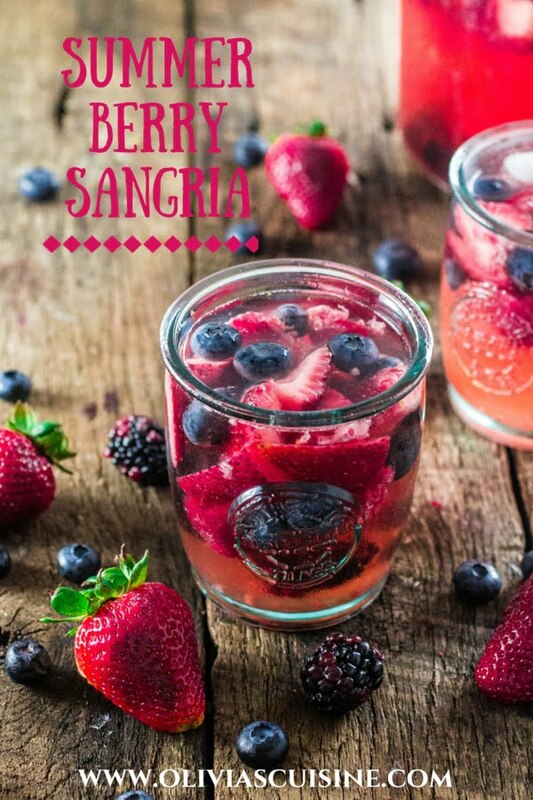 I’m celebrating Summer with a delicious and refreshing Berry Sangria! 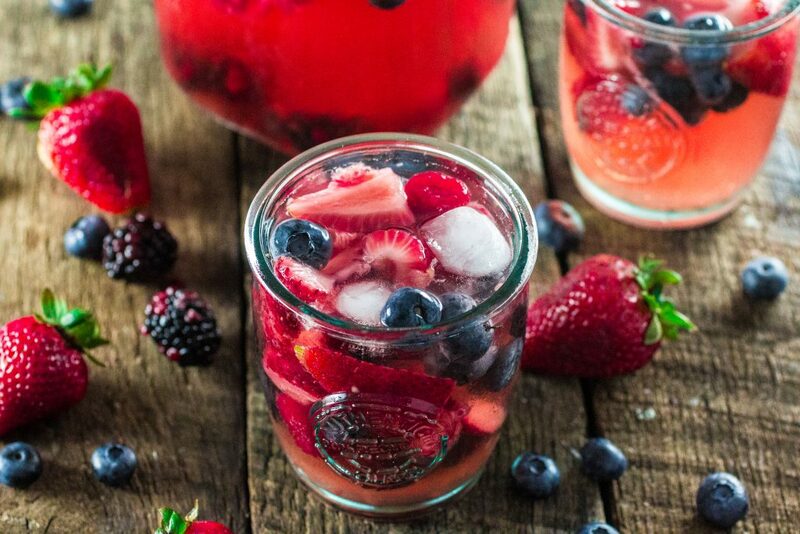 I made us a large pitcher of Summer Berry Sangria to celebrate the fact that we finally found an apartment! Woohoo! I had already given up and decided to stay at my current (super expensive and tiny) Manhattan place when a realtor called me about this rental I had messaged her about a while ago. So we went to check it out (even though I wasn’t too thrilled about the place) and it turns out that because of miscommunication it was a completely different place and that was A-freaking-MAZING! It was like the odds conspired for us to end up seeing (and getting) this beautiful apartment, which – by the way – is a HUGE 2 bedroom and 2 bathroom (aka unicorn in NY/NJ terms) and has a balcony and a walk in closet. So then we got home from seeing our dream apartment and the Middle Sister Moscato bottles that were sitting in our fridge looked at me like “it’s celebration time”! In one second I tossed together some fresh berries, strawberry liqueur (although I would have loved to use Chambord – raspberry liqueur – instead! ), some agave and a whole bottle of this amazingly crispy and sweet Moscato. After an hour chilling in the fridge, I added some Raspberry Lime Seltzer and my sangria was ready to party. And just like that, the world was a perfect place, with unicorn apartments and delicious sweet cold sangria, and I was… just happy! I know the phrase “happiness is in the small things” is a big cliche, but at this point in my life it couldn’t be more perfect! 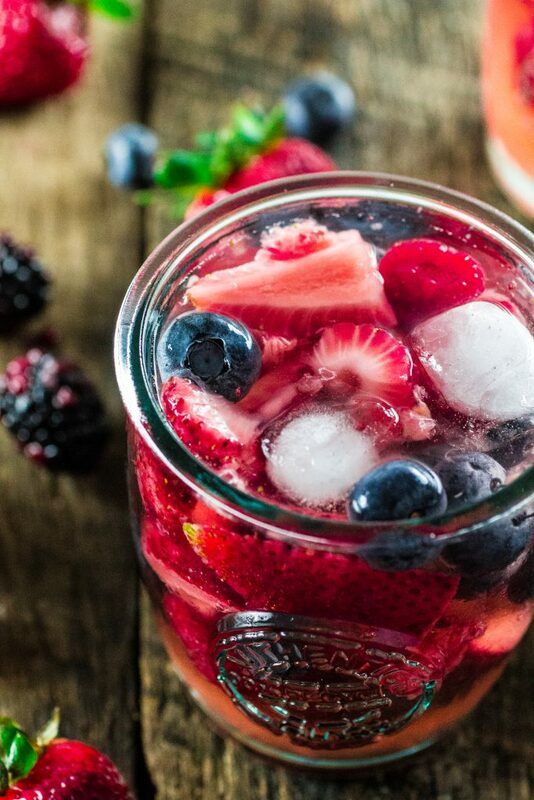 A glass of Moscato – or a whole pitcher of Berry Sangria – on a hot summer day is all I need to relax and celebrate small (or big) achievements. The Moscato is a wine that especially has that happy, fun tone. It is not the type of wine to drink when you’re sad and wanting to forget about the world. It is upbeat, smooth and cheerful. Like a sunny summer day! Middle Sister even named it Sweet and Sassy Moscato. Suiting, isn’t it? 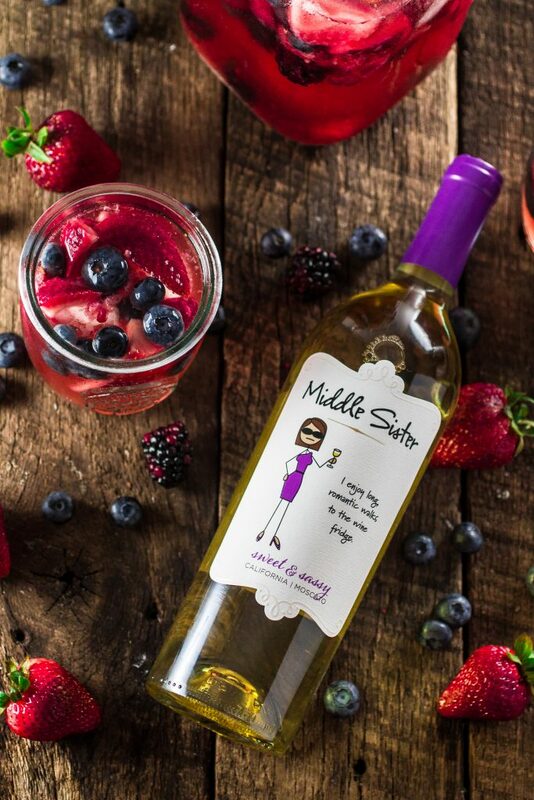 Seriously, though… Next time you’re celebrating something but don’t have the big bucks to spend on the expensive bubbly stuff, look for the Sweet and Sassy Moscato from Middle Sister. Or any of their other wines, really, as they are all so tasty and perfect for any kind of celebration! We already established that their wine is utterly delicious, but it is also – wait for it – AFFORDABLE! So you won’t feel guilt about opening a second or a third (maybe a fourth?) bottle. If you haven’t tried their stuff, get on it! Their wine is crafted by award-winning winemaker Nancy Walker (a middle sister herself) and they have in their portfolio a wide variety of delicious red, white and sparkling wines from California and Argentina. Not to mention the CUTE labels featuring different middle sister personalities! I am not a middle sister – I’m an older sister to my brother – but that doesn’t prevent me from loving this brand and completely identifying with their Sweet & Sassy (or, ahem, the Drama Queen) wines. And as for packing for the new apartment, this sassy girl thinks she’ll start with an essential suitcase. You know, the stuff we’ll need right away… Pajamas, sheets, toothbrush and, of course, a bottle or two of Middle Sister wine. 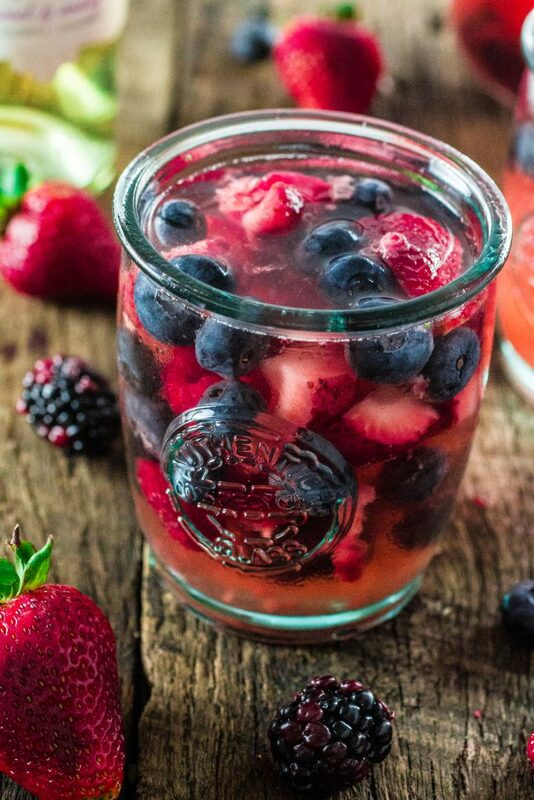 Combine the berries, the raspberry (or strawberry liqueur), the agave (if using) and the Moscato wine. Chill for 1 to 3 hours. Before serving, add ice and seltzer to taste! Notes: The sangria improves as it chills in the fridge. 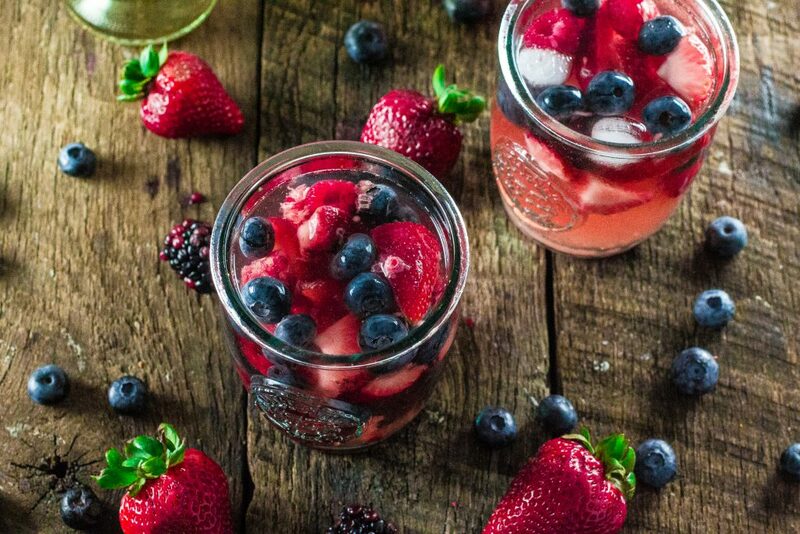 However, if you don't want your berries to be soft, just chill the Moscato, the liqueur and the seltzer separately and toss everything together with the fresh berries right before serving. I had this when I was living in an apartment with electric stove and this portable gas stove is quite good! Beautiful and refreshing drink!!! And I’ll try to find this wonderful wine here in Brasil – the Middlle Sister, that looks great! Congratulations on the new place!! I used to live in DC and have only a small hint of how amazing a 2bd/2ba would be! How exciting! Hi Olivia, I’m trying the sangria for a lunch party tomorrow. Approximately how much seltzer do you add? I’m not sure and don’t want to add too much or not enough. It sounds delicious – thank you for posting this! Also looking forward to trying ice cream recipes. Oh my goodness! This looks so good! Also I LOVE these glasses! Where did you get them? What are they called?